1. Hybrid high release paper. Mprés releases more dye in less time onto the printable substrate than most other papers of this type for richer, deeper colors and better clarity. 2. Fast drying. Mprés dries almost instantly, eliminating any quality issues like tracking or smudging. 3. Universal sublimation paper. This paper works perfectly with any sublimation printing system including Ricoh and Epson, and any sublimatible material. 4. Print at multiple DPI levels. This paper allows you to print at higher DPI levels (for use with ceramics, UNISUB materials, etc) and at lower DPI levels (emblems, mousepads, etc) allowing you to save ink. 5. Increased Productivity. Mprés Paper requires less press time and dries faster than many other papers, and printing at lower DPI levels may also increase printing speeds. 6. First-Hand Product Knowledge. We not only sell Mprés Paper, we use it ourselves every day. We have the first hand product knowledge necessary to help our customers successfully use the product. 8. We’ll Send You a Sample of Paper Free! – We’re so confident that you’ll love Mprés as much as we do, that we want to introduce you to it by offering you a free 10 sheet sample pack of 8 1/2 x 11. 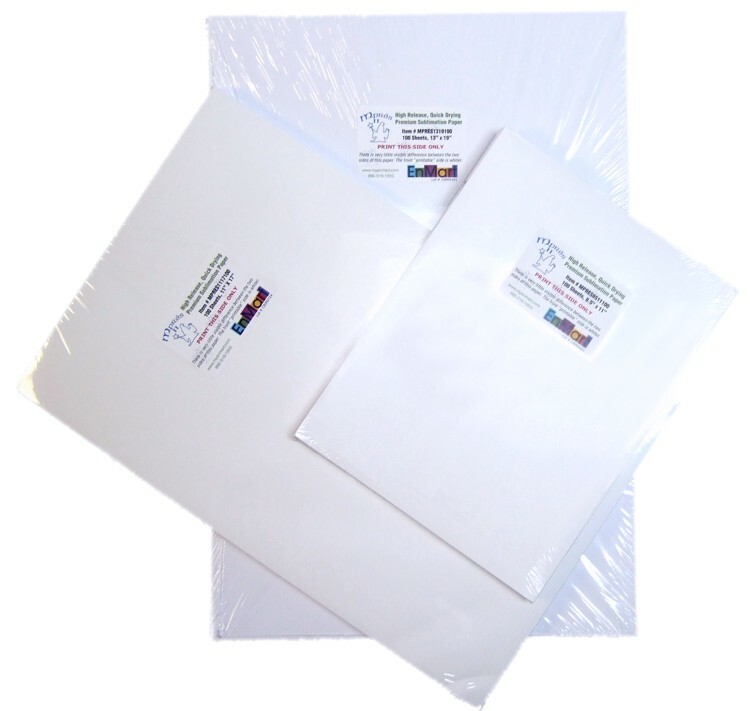 To request your 10 sample sheets, contact us at 866-516-1300 or e-mail us at mpres@myenmart.com. I’d love to give your paper a try. Do you have have transfer paper for dark materials?